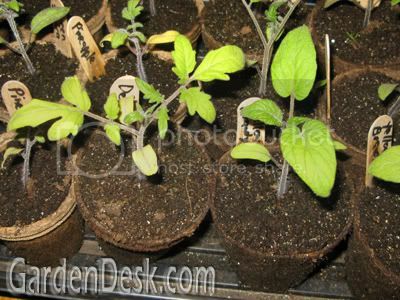 Most of my tomato seedlings that I just potted up look really healthy and strong. They are a bit smaller than I would like them to be, but they look good. 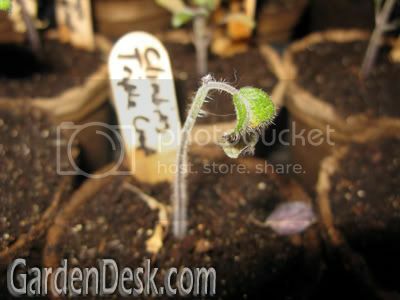 The transplanting session that I wrote about yesterday was not the first one. I began potting on the tomatoes about two weeks ago. Unfortunately some plants from the earlier sessions have problems. I don't know if they are victims of Damping off disease or if they have a different fungal problem, but they look pretty bad. I wonder why some plants are suffering from this while the majority look great. I guess it could be the difference in the varieties and their resistance to disease. I lost all of my Kentucky Beefsteak and Prudens Purple plants. Where it gets more curious is in cultivars like Persimmon and Climbing Triple Crop, because some plants look good and some look bad. Is this because they were separated in different trays, or is it just because the "good" ones are yet to show symptoms? One thing that could have caused this is the fact that I used some trays that were left outside all Winter (I know, that is bad and pretty unorganized). I rinsed them out, but I guess they could still have been infected with something. Since I bottom-water all of the seedlings, I guess it could spread to the tomato seedlings that belong to the varieties that have less disease resistance. I really don't know. I lost about 20 plants but that is still a pretty low percentage of my overall plants. Hopefully the other million plants will continue to prosper. 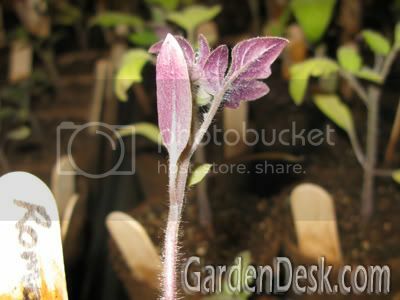 The other problem that I am having with the tomato plants is that many of them are purple. Only the underside of the leaves are purple, and I know what that is. It is due to a phosphorus deficiency because of the soil being too cold. Hopefully that will remedy itself when the plants (and their pots) warm up. I gave them all a dose of Great Big Plants to try to help them out as well. Well, there you have it - kind of a depressing post compared to most. Gardening isn't always roses and sunshine I guess. Stuff happens. In a week or two, all of the tomato plants will finally be planted outside and hopefully will take off from there. 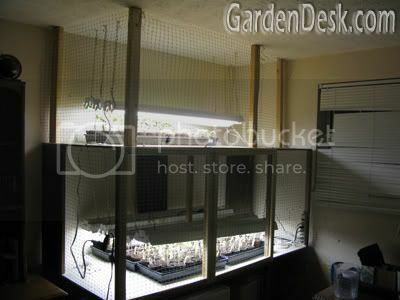 Until then, they will be waiting under lights on my grow-light stand. I'll let you know how they work out later. At least my extra-early tomato plants are already outside and doing well. I can't believe it has taken me a whole week to post this. Last Saturday, when we got home from vacation I took inventory on the garden happenings and wrote it all in my paper journal like the old days. I really do like paper records better than digital ones, but journaling on the computer allows one to post photos much easier. So I think I will be journaling here at Garden Desk. These posts will be a bit different than my others because it will just be a list of how things are going. It may be more for me than for my readers, but you are welcome to read along. Maybe you can help me by commenting on how I could fix my problems or improve things. I already wrote about the new potatoes I bought last week. I have been pretty frustrated with my peas. 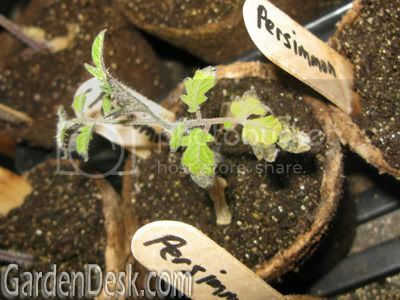 The germination rate is listed as 7 to 14 days but after 18 days there was still nothing. Finally, they are emerging! In the pea beds, I transplanted the lettuce plants that I grew inside and hardened off in the cold frame. I was delighted to find that the beds were teeming with worms! I hope that means that the soil here is healthy. Now the beds look prettier. I hope the lettuce grows bigger quickly. Also growing well outside are potato onions and garlic. Inside, the early tomato plants were looking great. Uh oh - upon closer inspection maybe not. What are these tiny spots on the Orange Blossom tomatoes? I had no idea, but a gardener is only as good as his gardening book library. I hit the books and found out that I had Septoria Leaf Spot. I found it in my trusty Organic Gardener's Handbook of Natural Insect and Disease Control: A Complete Problem-Solving Guide to Keeping Your Garden and Yard Healthy Without Chemicals . It has an extremely long title, but it is also extremely helpful! It says that Septoria Leaf Spot is Fungal. The control is simply to remove and destroy infected leaves, so that is what I did. Now, a week later I'm happy to report that there are no new signs of the fungus. I will have to keep a close eye on them. Luckily it was only on three of the four Orange Blossom tomatoes and none of the others. Even if the Septoria leaf spot comes back and damages or destroys the Orange Blossom tomatoes, I have five other early varieties ready and will be raising almost 30 other varieties. I guess I could afford to lose one variety.